This exhibit gives an impression of the lives of the thousands of Icelanders who immigrated to the New World. Their reasons for going and the climactic, social and economic situation in Iceland at the time, are explored through a combination of photographs, texts and artefacts. Set pieces and reconstructions are used to illustrate the lifestyle of the ordinary Icelanders in the late 19th century. Year-by-year descriptions of weather conditions demonstrate the influence of the climate on emigration patterns, while maps and charts show where Icelanders came from, where they settled in the New World, and how many emigrated each year. The emigrants’ hopes, their preparations for departure, their travelling conditions, and the reality that awaited them in the New World are described. 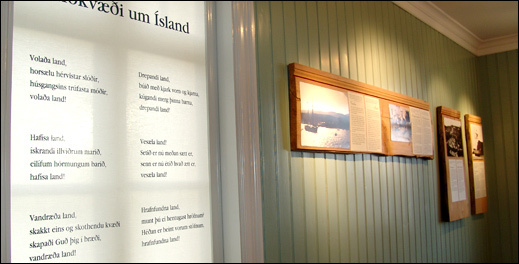 The exhibit is owned by the Glaumbær Folk Museum, which is responsible for the historical aspects of the emigration, and conserves and collects articles relating to the Icelandic emigrants.